I have had my fair share of doozies when it comes to relationships but I will not bore you with those stories today. If you can imagine it, I probably have been through it. With all of my previous failed standards, I had a rule - no matter what, I would not dare date a Seminole fan/grad/etc. I am a born and raised Gator fan who went to High School during the hype of the Seminole's success of the 1990's.While all of my friends sported garnet and gold, I proudly wore orange and blue. We were the underdogs. 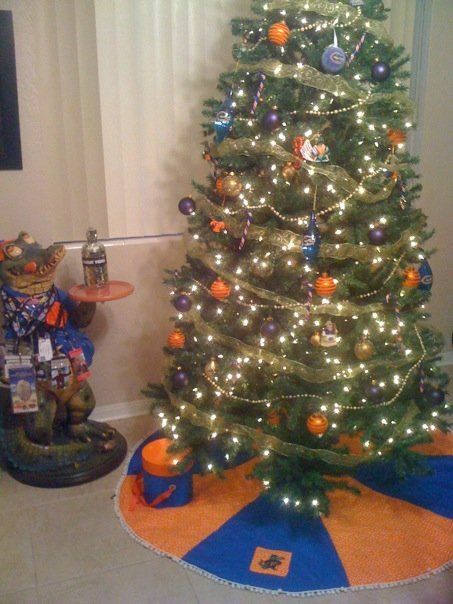 By some stroke of magic, the Gators won the National Championship in 1996 vs. FSU (along with a Heisman). This nailed the coffin in the state rivalry. Ummmmmm. You see the long lanyard on the left of my Gator statue? That's a 2006 BCS National Championship ticket. I also went to the Sugar bowl in 2009. My boyfriends entire family, who I love dearly, are also Nole fans. 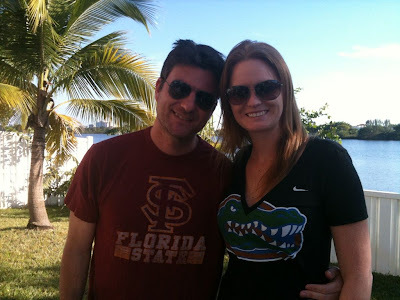 In 2010, we encountered our first Nole/Gator game together. At halftime, I found myself in the kitchen cooking to reduce my stress. The Gators lost to the Noles for the first time in many years. The following year, we did not watch the game together. The Gators once again lost and I continued to hold my head up high. When the suggestion came that we would be spending Thanksgiving at Gabe's sisters house in South Florida, I was all for it. A) I love Gabe's sister, she was a good friend of mine in high school and it is awesome having a friend as a (hopeful) future sister in law. B) I love Em's kids! C) It's a mini-vacation down south. Then it hit me. I would be the ONLY GATOR amongst a house of Seminole Grads and fans. Except for Gabe's niece who could not be brain washed. Check out her doing the chant. Dear god, help me now. I stressed out all day. No one was being cocky towards one another although I was frequently told I was wearing the wrong colors. The game started and around halftime, I had a few vodka drinks in me and was feeling good all around with a half smirk on my face. At the end of the third quarter, I was drinking a strong margarita with a big frown on my face and come fourth quarter, I became a little mouthy yet still respectful towards the others. I behaved myself in the 2012 Florida/Florida State game. I was not this person three years ago. My loving boyfriend on the other hand ignored me for an hour after the game and cheered ridiculously crazy for Notre Dame to beat USC. It's just a game. No need for arguments, no need for one to ignore another. Yet I am not sure if these words would be coming out of my mouth in the opposite situation. My brother is a Jets fan and my Sister-in-Law is a Patriots fan. They deal with this twice a year. Do you deal with this sports madness in your relationship?